and cooker and bring new colour to your kitchen. the bottom of the tile falls. checking with the spirit level that it is vertical. Step3: Spread adhesive over about a four-tile area in the battened-off area. Use the notched side of the spreader to form ridges of adhesive. sides. Check the tiles are flat against the wall. Press spacers into each corner. 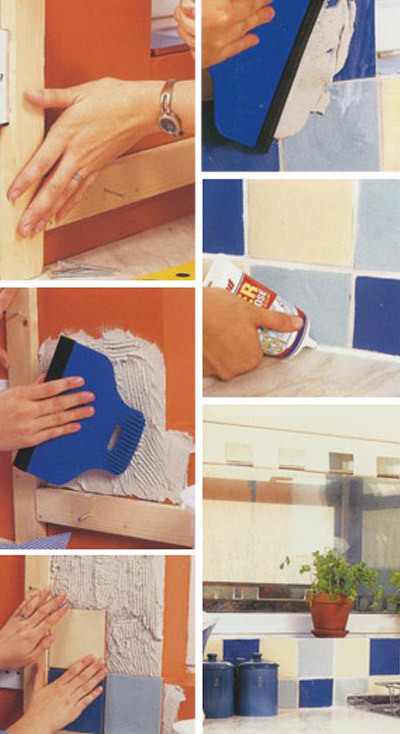 Step5: Lay tiles along the windowsill so that they cover the top edges of the wall tiles. fit into any gaps and fix in place. Step7: Grout the tiled area. Remove the excess with a sponge, then leave to dry. Step8: Seal the gap between worktop and tiles with sealant. waterproof grout & applicator, cloth, all-allpurpose sealant.